Brad Foster: June, Trinity, Cade and myself are doing well. My company, Delta Rehab Services, LLC has grown to encompass 5 SNF’s, 1 rehab hospital, and 1 outpatient center. I completed the Austin LiveStrong Marathon this past year. God has truly blessed my family and me. Joaquin Vargas: I work in a private practice at 20 Crescent St, Quincy, CA specializing in orthopaedics and sports. 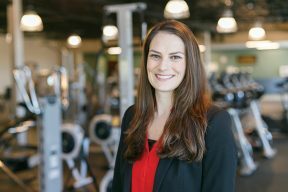 Paula Allia: Fitness Reps, LLP in downtown Naples was opened in 2004. Our focus started with personal training with a gradual development of physical therapy for prevention and to correct movement impairments before joint breakdown develops. I do not accept insurance and we are at the end of our 8th year and the business grows each year. Who better to set up quality and specific exercises than those of us in the PT profession who have a passion to not only treat injuries but to keep people well. We all have a responsibility to progress our profession forward to new heights. Phyllis Clapis: I was promoted to the rank of full professor in the DPT program at American International College. Chris and Erin Roosa: The Roosa’s are doing well in Frederick, MD! Maryland SportsCare & Rehab is about to open a new location in the Frederick Region, and Chris will be finalizing an Orthopedic Clinical Residency Program in early 2013. Many great employment opportunities available at www.ptnetwork.us. Gerry Catapang: I was one of the 14 honorees of the 2012 Springfield Chamber of Commerce/Business Journal Salute to Healthcare and Healthcare Champions held in October. Also I have released my new book, MY DAILY PAD, www.mydailypad.com. Jessica Chenevert: I have been the Clinical Director at Peak Performance Physical Therapy in Brusly, LA since 2006. In September, my husband Donnie, daughter Alex, and myself welcomed home a baby boy, Cohen Sal. We are truly blessed!! Keith Fogle: I recently celebrated my OCS certification this June and will receive my pin at CSM in San Diego in January. Ashley earned the prestigious Franciscan Award and awaits word if she is randomly chosen to visit/vacation in Italy for two weeks. We have two boys; Brooks and Hayes. Sue Machtley: In March, we welcomed our son Zade Alexander Machtley. It is such a joy to watch him grow and maintain my career by working part-time. I am grateful for such a flexible career! Misy Fleming: I am the senior physical therapist in a skilled nursing facility in Piqua, OH. I have been blessed with 2 beautiful daughters. Carla Bulla: This has been a very special year for me, my husband and I had our first child, Skyler Albert Estes. Our baby boy was born in Brazil on July 5th weighing 7.4 oz and 19 in. I took the rest of the year off to stay home with him. What a blessed and amazing experience!!! Kristen Gillette: We are expecting baby number 3 in mid-March. Klaus (4) and Bernd (2) are excited to have a new baby sister! Christy Kiesel: My husband and I stopped traveling earlier this year and have settled comfortably in northern Idaho. I work in acute care and do some teaching for the OT program over at Eastern Washington University in Spokane. We are expecting our first child in April! Terry Shepherd: I recently have added Class IV Laser to our cash-based program and brought in enough cash in 6 months to pay off 1 of 3 machines. I also completed my certification in Canine Rehabilitation with the University of Tennessee for another cash-based program. I am implementing a weight loss program in January 2013. Camille Boyle: Devin and I moved away from San Diego last fall and we’re now living in Ashburn, VA. I absolutely love my job in outpatient orthopaedics at Tompkins Orthopedic, which includes a medical gym, pilates classes, pilates reformer, senior classes and sportsmetric ACL injury prevention program. I hope to start a runner’s training and injury prevention program here very soon! Emily Burrows: I am currently working at Duncan Regional Hospital’s (DRH) outpatient clinic as supervising pediatric therapist. DRH has been a great setting for me as I have worked on the TCU/SNF unit, acute unit and outpatient clinic. Vanessa Chiu: I am currently working in an outpatient orthopedic clinic in Daly City. The facility has a pool for aquatic therapy that we use for bariatric, neurological, and post-operative patients. I have taken advanced courses in myofascial decompression (a Western version of traditional cupping), along with Pilates. I have published an article with the California Physical Therapy Boards newsletter regarding my transition from PT school to career. Joshua Sindoro: I thank USA San Diego professors and staff for preparing me to be a clinician that values excellence and quality service. 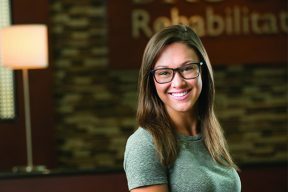 Through the education that I received, I have gained the confidence and skills as a physical therapist and a Director of Rehabilitation. Lynn Billeter-Ellegood: Lynn Billeter (now Billeter-Ellegood) and Bill Ellegood were married September 15, 2012 in Columbus, IN, at First Christian Church. Lynn and Bill had a wonderful honeymoon in Canada and Maine. Lynn also graduated from USA in St. Augustine in April 2012 from the Transitional DPT program with High Honors. Pamela Breckenridge: I’m living my dream! I am currently a traveling DPT. I will be applying for a neuro residency program and become a Neurologic Certified Specialist. God willing I would also like to return to USA for my MTC and with more experience receive my PhD in Physical Therapy. Life is so good. 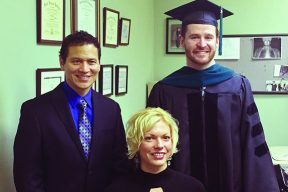 Tracy Camaj: I completed my Transitional DPT, Manual Therapy track. I am planning to take the manual certification course and test in the upcoming year. Julie Johnson: I am currently working in Uganda, East Africa at a Pediatric Neurosurgical Hospital. We mainly focus on pediatric rehabilitation but are currently expanding to cover outpatient orthopedics and adult post-op spine patients. I am also working with some of the local PT’s to start a Bachelor program in physiotherapy in Uganda. Rebecca Parnell: Currently working at University Hospital in outpatient services. I am also OCS and GCS certified. I see a wide range of patient, USA helped me update my skills and feel confident.